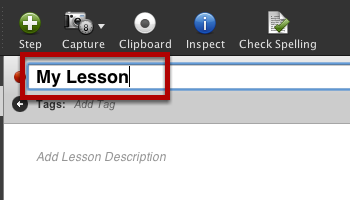 To create a new Lesson, click on the New Lesson button. A new lesson will be created and opened for editing. 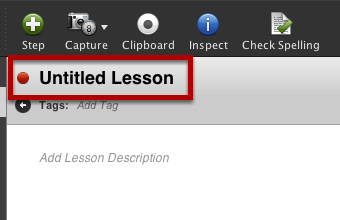 Click on the lesson title to edit it. Click the Step button - this creates a blank step. Click the Capture button to capture a screenshot and create a new step. You can also open the Capture Palette by clicking on the arrow next to the camera. Turn on the Clipboard Recorder. 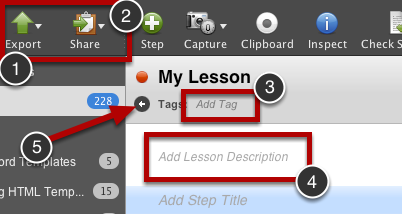 Any image you place on the system clipboard will be added to your ScreenSteps lesson. Here you can see that I have captured an image. A step has been created. 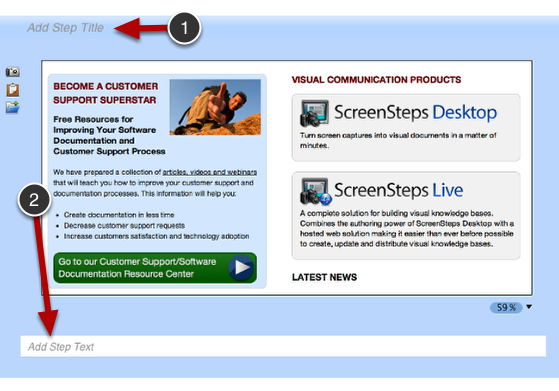 You can add a step title (1) and/or step instructions (2). Just click on the fields to edit them. You will see the image annotation tools appear in the toolbar. Select the tool you want to use and draw on the image. Open the Inspector palette to adjust the color, thickness and other annotation parameters. Here I have used the rectangle tool. 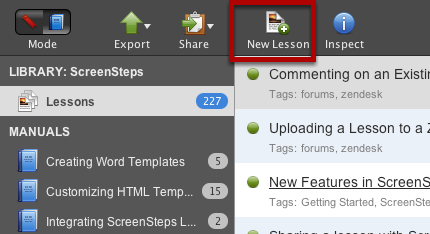 Export the lesson to HTML, PDF, to your own blog/wiki, Word (Pro only) or to ScreenSteps Live. Share the lesson using Clarify-it.com or by copying it to the system clipboard as HTML or PDF. My line and arrow annotations will not go past the outer line of the graphic. In this lesson it appears that it does. I have a lot of text and graphic images outside of my target image so there isn't any white space to pull the arrow into. How do I do this? @crystal: Annotations cannot currently be drawn outside of the image itself. 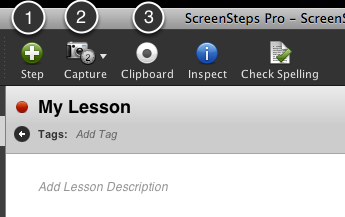 The annotations you see in this lesson are drawn on screenshots of the ScreenSteps interface. If you need more space around the image you will need to take a larger snapshot or add white space using an external image editor. If you right-click on an image there is an option to edit it in an external editor. Being able to add white space around images from within ScreenSteps is planned for a future version. Is there a way to place text next to an image? Instead of being able to add the step at the bottom of an image can you place it literately to the sides of images. 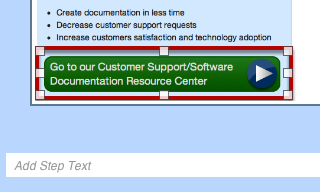 If the answer is no, then are their ways to actually insert text blocks in screensteps? You can't position text to the side of an image in the editor. 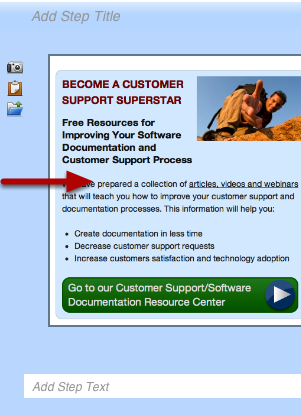 But you can position the image to the right of the text in HTML or PDF exports. Is there a way to add an image to the "lesson description" page? @Shavonne - no, it is not. Images can only be added to steps.